1 What would you expect great poets to be like? Would they be outgoing, busy people who enjoyed life? Emily Dickinson was none of those things. She cut herself off from the world and thought about the things going on around her. Her innate talent created poems that are considered some of the finest ever written in the United States. 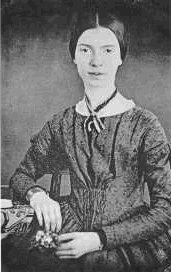 2 Emily Elizabeth Dickinson was born on December 10, 1830, in Amherst, Massachusetts. Her grandfather was one of the founders of Amherst College, and her father was both treasurer and lawyer for the school. He later went on to become a state senator and a U.S. representative. 3 Emily did not care for all the excitement of public life. She preferred to spend time alone reading. Her father saw that she got an excellent education attending Amherst Academy for seven years, and she spent a year at Mount Holyoke Female Seminary. 4 While she could have fun with close friends, Emily would seem very shy with strangers. It was right after her year at the seminary that she started to become reclusive. She began wearing only white clothes, and she refused to see most of the people who came to visit her. Rarely did she travel outside of her hometown.